The 'black' of this dish's name refers to the dark-roasted curry powder. It adds a mellow fragrance that is nicely balanced by the tartness provided by the tamarind and vinegar. These quantities make 30g curry powder; if you want to make a larger batch, it will keep in an airtight jar for a couple of months. For the curry powder, heat a heavy-based frying pan over a moderate heat. Add all the ingredients except the bay leaf, cumin seeds and chillies. Dry-fry, stirring constantly until all the spices are well browned. Now add the bay leaf, cumin seeds and chillies; continue stirring until they have begun to brown too, and the rest of the spices are a slightly alarming, almost-burnt dark brown, but don’t actually let them burn. Tip into a bowl and cool for a few minutes, then grind to a powder. Allow to cool completely. Put the onions, ginger and garlic into a food processor and whiz until finely chopped. Heat the oil in a large pan or wok, then scrape in the onion mixture. Fry until beginning to colour, stirring constantly so that it doesn’t burn; add the bay leaves, cinnamon stick, cardamom pods and the roasted curry powder and fry for 1 minute. Add the pork, and stir around until fragrantly coated with the mixture. Stir in the vinegar, tamarind paste and 200ml water, then season with salt. 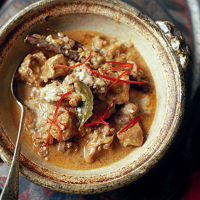 Bring to a lazy simmer, cover and leave to simmer for 1–1½ hours until the pork is tender. Stir in the coconut cream and cook for 10 minutes. Taste and adjust the seasoning; scatter with the sliced chilli before serving. The flavour fireworks here are best calmed down by a well-chilled yet fragrant and complex beer.